Internationally acclaimed illustrator and dear friend of Cass Art, Marion Deuchars is famous for her quirky, warm illustrations and her ‘Let’s Make Some Great Art’ best-selling children’s books. As part of Homecoming 2014, an initiative showcasing the best of Scotland, Deuchars has an exhibition of her work in her hometown of Falkirk, hosted at The Park Gallery, Callendar House. As the namesake of her first best-selling book, the exhibition is a showcase of her work, as much as a tribute to the creativity of others. 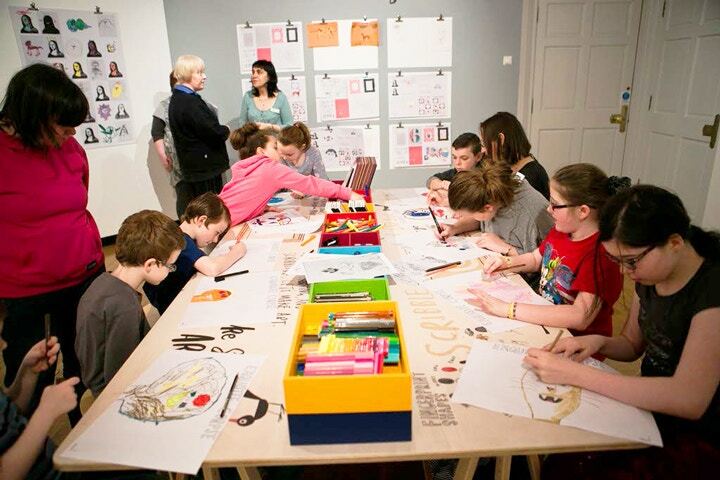 Marion Deuchars: Let’s Make Art will run from 3rd May to 20th July, and involves interactive work stations for the visitors as well as the illustrator’s own drawings. Children and adults alike are invited to come and get messy – to make paintings and drawings of their own. We caught up with Marion about her exhibition, the ideas for her books and her favourite drawing tools. Firstly, what was it that drew you to art, especially illustration in particular? I think my interest in comics as a young tomboy led me to art. I don't think I really knew what Illustration was until my second year at art school, but looking back, the comic influence and access to magazines like the New Yorker and Mad magazine that I would see at the comic conventions, had definitely planted a seed. Can you tell us a little about your Park Gallery exhibition – how it came about, and what you think it says about your work? I was invited to take part in a festival called Homecoming after the gallery curator saw an article written about one of my books in the Glasgow Herald by Teddy Jamieson. She saw that I was born locally and made the connection. 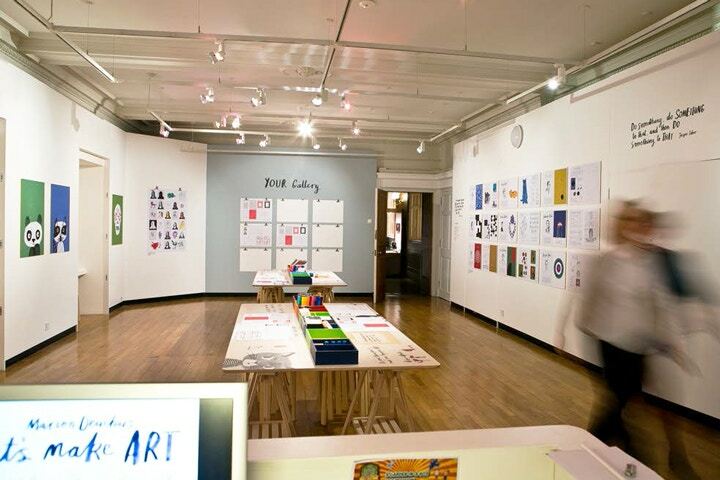 The Park Gallery is in Falkirk, my birth town. Two artists I really like – Elizabeth Blackadder and Alan Davie – were also born in Falkirk and had recently exhibited at the Park Gallery. I wrote down in a notebook right at the beginning of planning the show and decided I wanted to create a show that was fun, engaging, interactive, educational, and most importantly tried to help adults lose the fear of drawing. I knew children wouldn’t have a problem in picking up a pencil or brush in the gallery space! It was great to make a show where 'you can touch' rather than just look, and that was the thinking behind it. The exhibition could in this way be construed as a mixture of workshops – do you have a favourite activity among the many? One of my favourite activities in the show and from my books is 'Make Your Own Mona Lisa'. You are invited to draw the Mona Lisa's smile onto a drawing of her minus a mouth, followed by a drawing of only the Mona Lisa's eyes and nose which you have to complete in your own style. I've collected thousands of 'interpreted' Mona Lisa's now and some of them are fantastic. They range from everything, from Mona Lisa as Mona Dracula to even Bart Simpson! Also for the exhibition I had some rubber stamps and stencils made, and these have proved very popular. Basic printing, which is what rubber stamping is, can be a great introduction to mark making and drawing. It's less scary to stamp and fingerprint than it is to take a white sheet of paper and a pencil. Your ‘Let’s Make’ books are hugely successful, and sell very well in our own shops. What was the thinking behind them, and were they always intended to be a series? The thinking behind the 'Let's Make' books is simple. Get off the screen for a moment and make stuff with your hands. I wanted to remind kids and adults that the best world you can create is on a piece of paper right in front of you; there are no creative limits and drawing is downright good for you. They were not initially intended to be a series, but it's a great, endless subject. I'm not going to run out of ideas, so I'll make more books as long as I enjoy doing so. We’ll hold you to that! Do you have a favourite drawing tool in particular? My favourite drawing tool is whichever tool I've recently acquired or rediscovered. I am always curious and like trying new things. Cass Art shops are dangerous places for me! There are too many tempting things to try – I go to buy one thing and come out laden with extras. It seems you can never have enough pens and pencils. Alternatively my kids brought home some twigs the other day and I stole those to dip in ink and draw with. I tend to draw from imagination rather than reality nowadays. I used to love drawing in the street or in a new city or place I'm visiting, and I’d like to get back to that at some point. And finally, do you have any other upcoming projects that you’re particularly excited by? At the moment I'm working on some products linked to the books, so postcards and notebooks and hopefully some art kits. I've also started working on a book about the Surrealists, but it's at a very early, exploratory stage at the moment. Plus I’m happiest when I'm just playing with ideas and images. I've been very busy the last few years and it's important to find some time to 'play' before embarking on another big project. That's where I am right now and enjoying every minute. The opening hours of The Park Gallery are Monday to Saturday 10am-5pm and Sunday 2-5pm. Shop online for Marion’s ‘Let’s Make Some Great Art’, 'Let's Make Some Great Fingerprint Art' and ‘Let’s Make Some Great Placemat Art’ books. Stock up on your own art supplies and shop online for some new drawing tools, including charcoal, graphite pencils and Sharpie Fine Permanent Markers. View Cass Art’s previous blog on Marion’s interactive books here. Read more about Marion’s exhibition here.